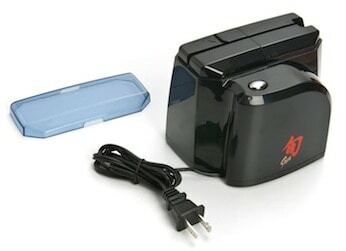 The Shun AP0119 Electric Sharpener is definitely a tool worth considering if you have Asian knives in your kitchen. More specifically, the product is aimed at customers that have already purchased a Shun knife. Now, before we continue the review, the fact that the sharpener is designed for Shun knives is quite interesting. If you are a Shun knife owner, you can actually send your knife off and have it sharpened by the manufacturer – for free. All you have to pay for is the postage. With these guys you know you are going to get proper factory sharpened knife restoration. 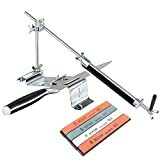 Considering the fact that assuming you maintain your knives correctly, they should only need a real sharpen once or twice a year, you might want to opt for this service rather than pay out for the Shun AP0119. Just a suggestion – we thought we should raise the issue at least. Onwards with the review. 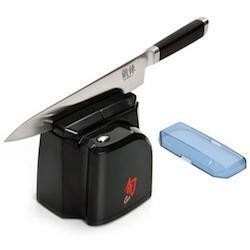 The Shun AP00119 electric sharpener is angled for Japanese style knives providing the obligatory 14-16 degree edge. The angle cannot be adjusted more than this, so the AP00119 is useless for any other kind of knife. The tool utilizes a combination of fine and course grits. Fast results are given just by pulling the knife through central stage. In fact just a few passes will bring the knife back to skin-splitting sharpness. The grindstones are removable, making the Shun sharpener very easy to clean. The unit looks nice in a shiny jet black, with a little red Asian motif in keeping with other products in the Shun range. Review websites remain undecided on the Shun. 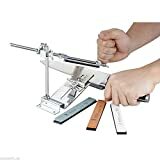 While there are those that gave it 5 stars and were very happy with the fast, simple to use product, other reviewers warned against using the tool on your most expensive knives. The fact that it was overly aggressive being one of the drawbacks. Overall however, it seems that if you have more than one Asian knife in your repertoire, and do not want to go down the time-consuming whetstone path the Shun AP0119 electric is a worthwhile contender. Just tread carefully if using ultra high-end knives in the unit.